In 1959, Bert Jabin settled his Yacht Yard on Annapolis’ peaceful Back Creek, laying the foundations for a family business dedicated to providing exceptional service to boat owners and their families. Today, two generations of Jabins lead an experienced staff committed to making your boating experience a great one. 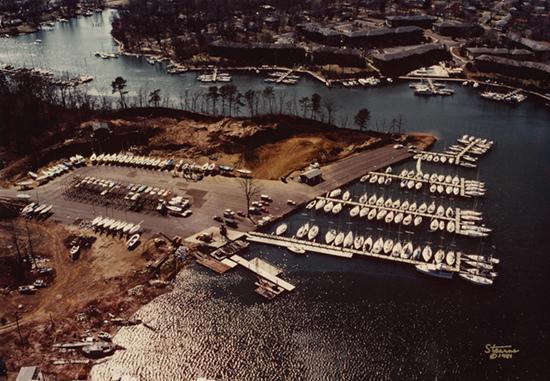 During the past 50 years, the Yard has gone from being an undeveloped plot of land to earning distinction as one of Annapolis’ largest complete marine service marinas. Here you’ll find our award winning high and dry boatel operation, more than 200 slips for power and sail, and over 25 independent marine service providers on-site. With a strong focus on customer service, our team at the Yard is always available to help handle and coordinate any of your boating needs. Our location provides great protection from wind and waves while still offering easy access to the Chesapeake Bay, only minutes away. We’re devoted to keeping our environment clean and healthy, practicing environmentally friendly initiatives that help make us one of Maryland’s Certified Clean Marinas.